Still working through my stash of paper and ribbons. It seems like years ago that I last bought one of those large paper packs from the craft store. They seem like such a good deal because it works out to pennies per sheet when they are on sale. And it is cost effective, IF I'd ever use all that paper before I got tired of it. The other drawback is that so many of those papers are thin. This one is a good quality and I've made pretty good use of the different designs. The Upsy Daisy stamp looked so great embossed in white on Razzleberry Lemonade DSP a few days ago, I tried it on this DCWV paper from my stash. The daisy flower in front is a paper flower that I touched up with a little Whisper White ink. One issue with paper flowers is they tear easily when attaching small glue dots. I had to use the large popup dots from glue dots to adhere this to the card. 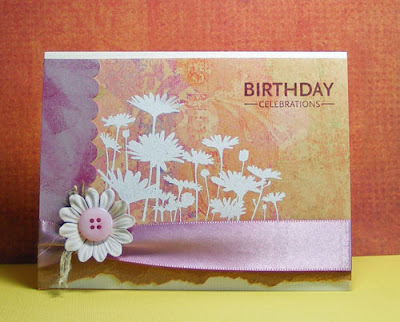 The scalloped cardstock on the side and the greeting are stamped in Purely Pomegranite, an In Color from a couple of years back. Ingredients: Stamp Set: Upsy Daisy from Stampin' Up!